Where are the Seams? Burlington’s new XALT™ Garment System is changing the look and function of today’s extreme outer garments with its invisible, reinforced seam structure. Stop by the Burlington booth at MR#204 to see the proprietary technology in action. The XALT GS technology combines the best components of soft-shell and hard-shell garment constructions to create a revolutionary seam technology that is not exposed or taped as in traditional garments but instead uses innovative laminated fabrics that produce a highly engineered and flexible garment. 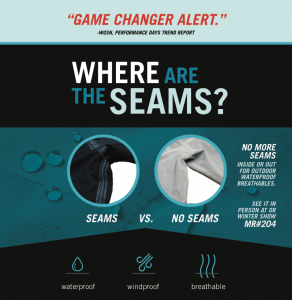 While the seam technology is invisible, take a peek inside and the remarkable results are immediately visible. XALT GS is part of the larger XALT – Xtreme Allweather Laminate Technology – family of advanced proprietary fabrics introduced by Burlington in 2016. XALT fabrics are unique allowing for the design of comfortable, quiet, breathable, insulated, stretchable, abrasion resistant, waterproof and windproof garments that also offer reverse design flexibility.